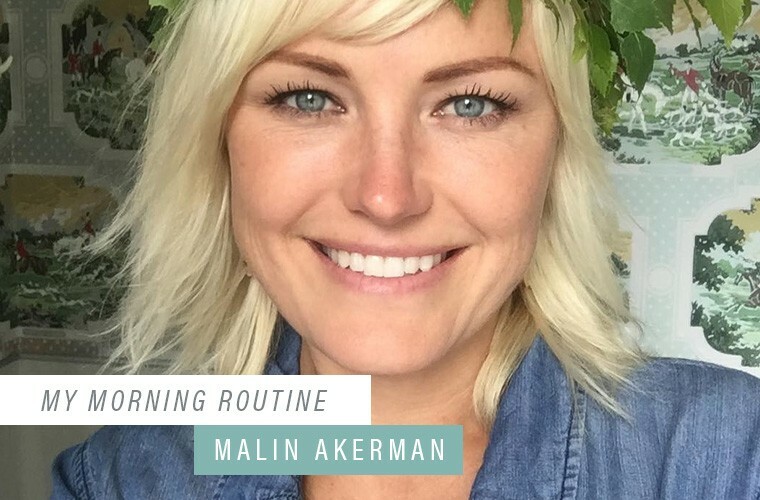 Welcome to My Morning Routine, where Malin Akerman and other good-life gurus share their personal (frequently surprising, often healthy) morning rituals—to help you make your a.m.’s more awesome. I grew up with a mother who owned a health food store, so wellness has been in my consciousness my whole life. It’s always been all about inner beauty and staying healthy and getting all the vitamins necessary in order to feel good. I always start my day with a hot cup of lemon water to cleanse the liver. I have a 4-year-old child, so it’s about hurrying up as quickly as possible. Breakfast changes—I think it’s important to change things up so that you get different nutrients from the foods you’re eating. I’ve heard that you can become sensitive to certain foods if you eat them every single day so I’ll switch between veggie omelettes, protein shakes, green smoothies, or oatmeal with flax and chia seeds and lots of berries. Or I’ll do avocado toast. I have this one smoothie I do that I love. It has a coconut milk base, pea protein, and I’ll throw in romaine lettuce, carrots, basil, turmeric, and a bit of sea salt. You get all the fiber and protein you need and it’s like a meal—it’s delicious. As far as my skin goes, Josie Maran has a really great line of products—it’s all argan oil-based. It’s important to not put too many fillers in skin-care products. I try to be natural with makeup too, but it’s different on set because they need makeup for TV and some stuff just needs to be a little heavier. After I pick my son up from school, I’ll either do a barre class, SoulCycle, or go to the gym. I’ve been so bad lately but one of my favorite things when I get into a routine is Transcendental Meditation. It resets the clock and gives you back your energy. It’s great midday or mid-afternoon. It’s also great to do when traveling. The one thing that’s helped me with stress is planning the night before. Usually it’s from being overwhelmed and a lot of things piling on—if you take a moment and prepare for your week ahead of time or the night before by writing stuff down and sticking to it, I find that it really helps. Other than that, if you take 10 minutes to meditate and get yourself grounded again, I think that’s such a nice way to reset. Then you’re able to handle more. Sleep, too—the more sleep you get, the more prepared you are for your day. For more morning inspo: Anna Camp explains how to be in a good mood instantly when you wake up. And this is the one ingredient Olivia Wilde always puts in her a.m. smoothie.